France in London | Who is the best First Lady? Who is the best First Lady? The times when a First Lady had to be self-effacing and fully behind her husband have been over for a while. Jacky Kennedy paved the way, and now being a First Lady is really a full time job. Fashion icon, supportive wife, independent and active woman... The perfect modern First Lady must be all that and more. The British First Lady, Sarah Brown, was used to keep a low profile. Unlike her predecessor Cherie Blair, Sarah seemed content to remain in the background in a supporting role thus carefully avoiding full blown media attention. The fact that she wasn't a famous ex-top helped a lot, the press did not care that much. However, everything changes. Gordon Brown’s wife finally stepped into the spotlight last September at the Labour Conference. She introduced his keynote speech – a very crucial one given the PM’s low popularity at the time. She said she was “so proud” of her husband’s achievements and praised his motivation to help people. However, even if this intervention made the media pay attention to Sarah Brown, she is not their favourite. In terms of media visibility, two First Ladies appear to be clearly at the top of their list: Carla Bruni-Sarkozy and Michelle Obama. They are young, beautiful, smart and of course married to leaders. It’s not surprising that they became the media darlings! the black and white dress she wore on a television show with Barbara Walters only cost £85! So, Michelle surely stands out of the crowd (when you’re 1.82m, it is not that hard), but in a way that every day women can relate to and aspire to. 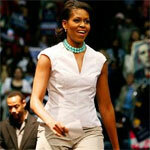 The two first ladies are not only unlike each other with their wardrobe. They do not play the same role in the public arena. Michelle is the supportive wife 'par excellence'. She was by her husband's side during the whole election campaign and was a tireless fighter. Now that Barack has been elected, she wants to be the voice of American women and mothers. “I will continue these conversations with working women and military spouses, and I’ll take their stories back to Washington”, she said. It would have been hard for Carla to be a supportive wife, given she was not married to Nicolas Sarkozy until after he was elected. In addition, the ex-top has long been known as a member of France’s “gauche caviar” (she was so close to the French socialist key players that she dated one of them). During the 2007 campaign she even declared that she “would never be right wing”. I guess feelings and politics are two different things! So, it is clear that the French First Lady is not going to change her political views. Instead, she decided to become an Aids ambassador to help fight this terrible disease. Carla and Michelle have however one thing in common. They are both independent women. Michelle Obama studied in Princeton and Harvard and became a successful lawyer, whilst the French first lady has been one of the world’s top 20 supermodels before turning into a succesful singer.Let's not forget however that she too had a good education. Carla speaks many languages and went to finishing school. In a word, the French and the American First Ladies are both very different; but we cannot deny that they are both high achievers with an amazing style. The French first lady is Italian! Does that disqualify her?